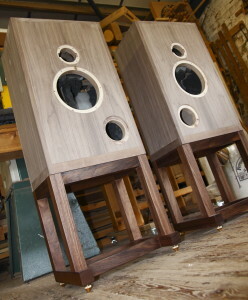 Reference Rhapsody loudspeaker stands awaiting final finishing. 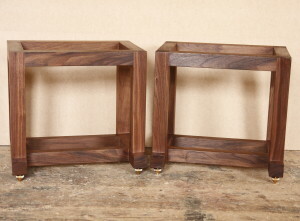 The Danish Oil is applied in a minimum of three coats before being left for a day or two for the finish to properly dry when a light rub down with wire wool will be undertaken prior to a final few coats being built up to enhance the finish and durability. Reference Rhapsody Loudspeaker Stands after 3 coats of Danish Oil. The last jobs remaining prior to veneering the front loudspeaker cabinet panels is to glue in the Neodymium magnets which will retain the grille covers. 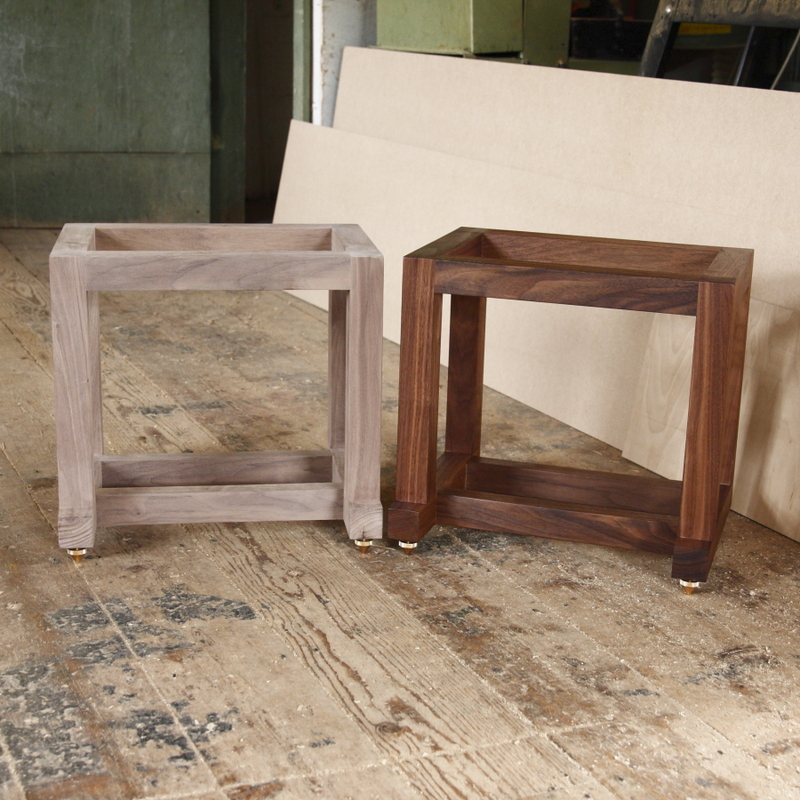 These are set in allowing approximately 0.25mm to the panel surface and skimmed with epoxy to protect the magnet and to help prevent chemical reaction between the magnet plating and tannins in the veneer from reacting and staining the veneer black. The reference Rhapsody loudspeakers feature a solid Walnut frame around each panel, the purpose being both aesthetic and structural. 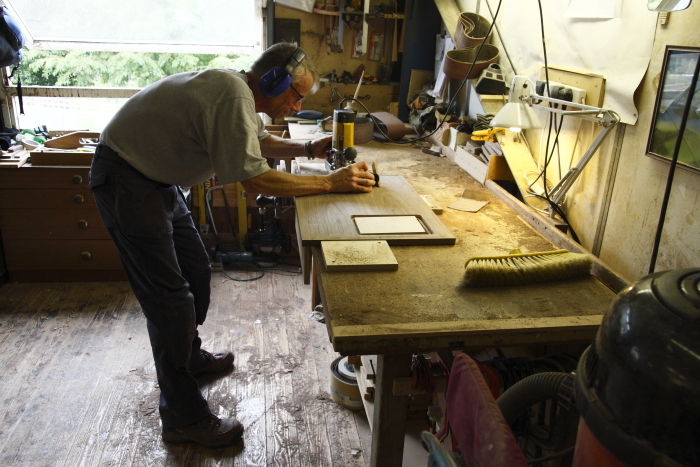 Here we see the final skimming of the walnut frame on one of the veneered side panels prior to assembly of the panels. Once completed and all veneering is done, each section is prepared for jointing and the ‘speaker cabinets assembled by laying the front baffle face down and building the side panels. 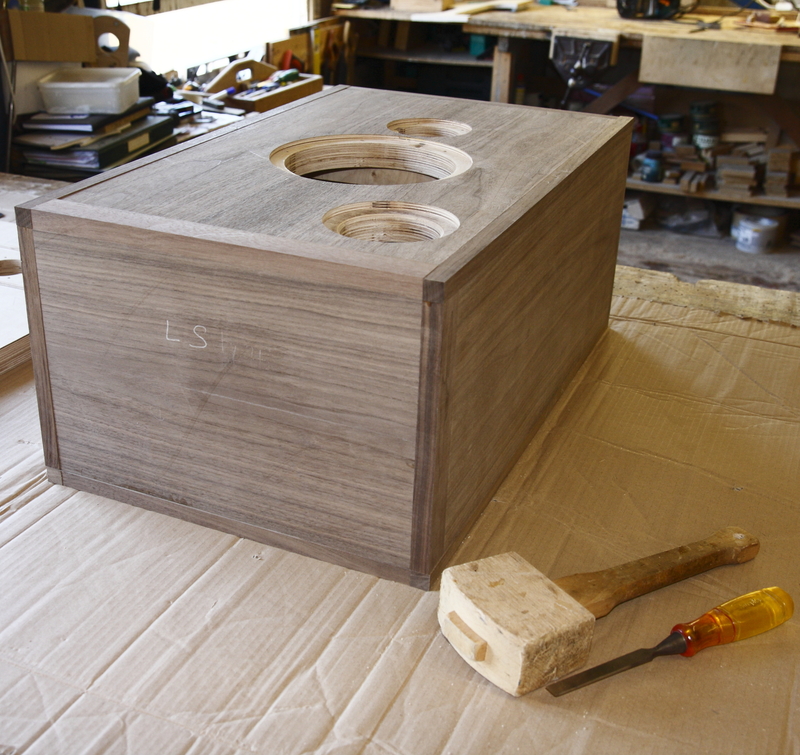 Once glued, internal bracing is added and jointed in and the rear panel glued into place. 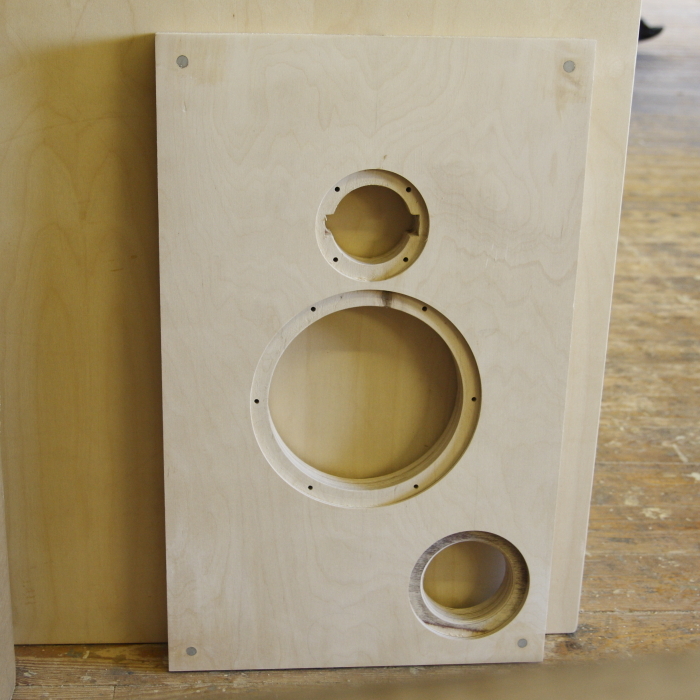 The Loudspeakers are now beginning to resemble the finished article at this stage although a lot of finishing works have yet to be undertaken! Attention to detail is a hallmark of all of Reference Fidelity Components products and the Rhapsody speakers are no exception. 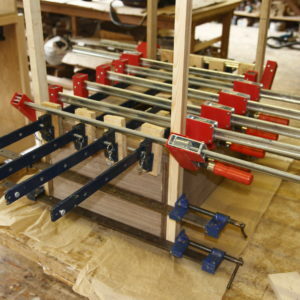 A great deal of thought and time has gone into the build by this stage, from selection of the very best quality timbers, the right grain sections for the matching veneer finish, the selection and cutting of matching grained timber for the solid Walnut frames and stands to consideration of how grilles will be fitted to avoid those awful plastic bobbin fittings. 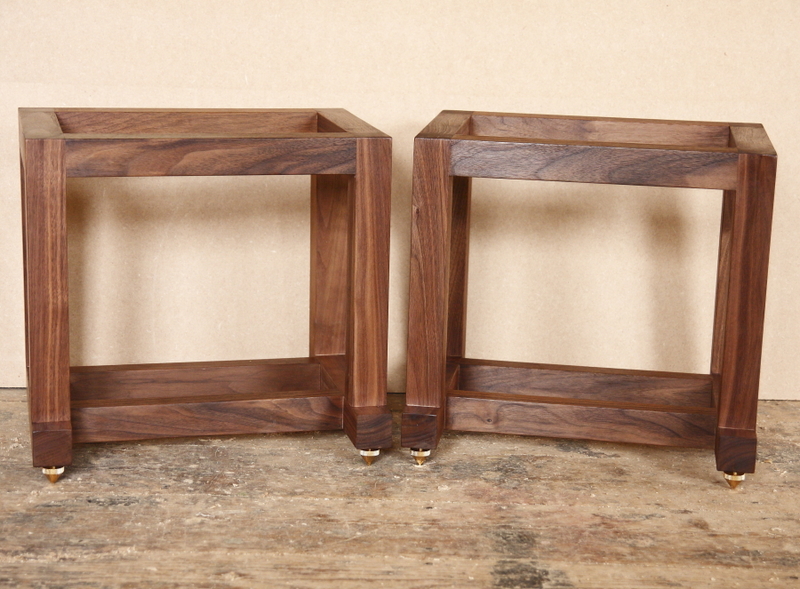 In this case hidden magnets have been employed in both grille frames and cabinets to avoid any unsightly fittings detracting from the natural beauty of the timber. 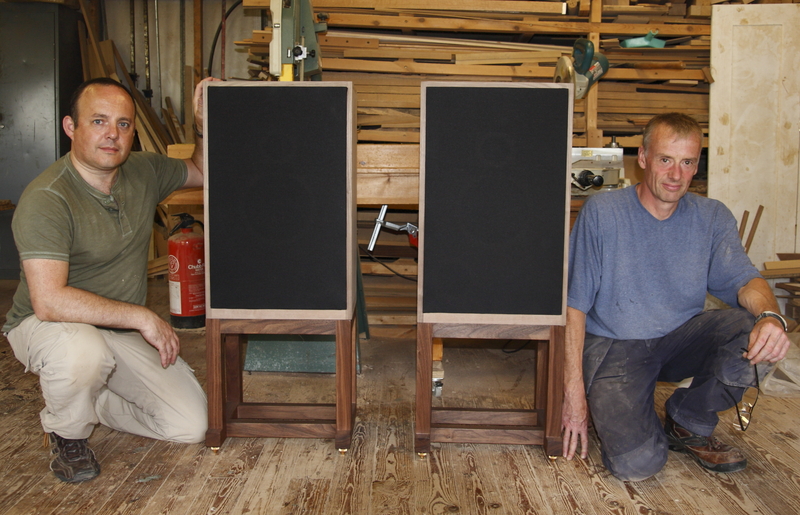 Equal attention will go into the final finishing of each and every pair of custom Rhapsody loudspeakers and each cabinet is hand finished to exceptional standards. 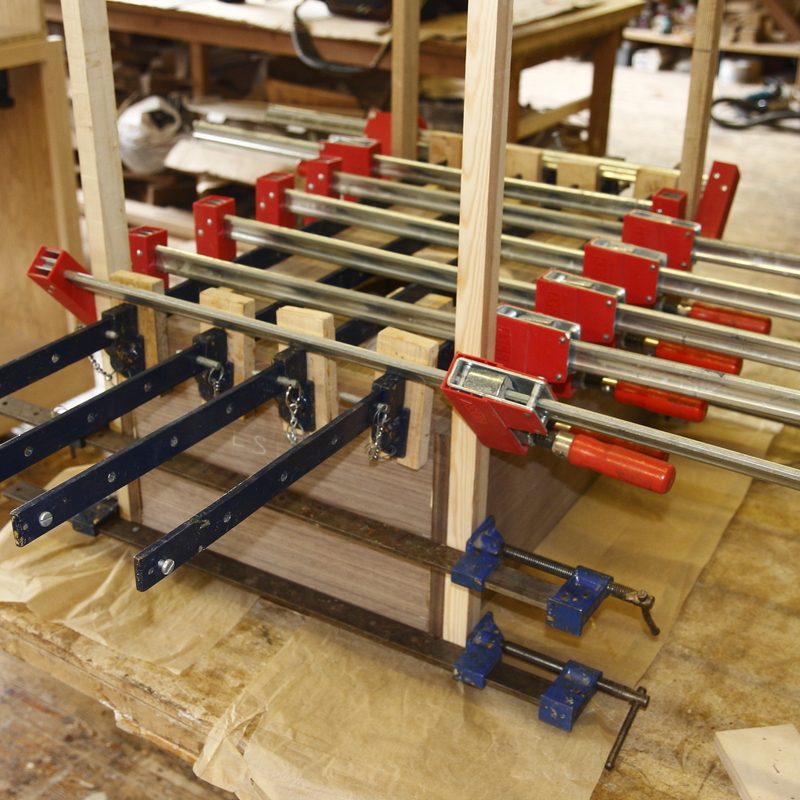 The final post in this series of posts on building the Rhapsodys will look at the finishing and final assembly and testing. At this stage, the cabinets require the edge rounding routed out, fine sanding to remove all machining marks and to prepare the cabinets for the final finishing works.